An adverb tells us more about a verb. They usually end in -ly. 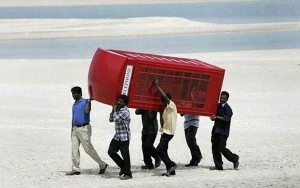 The men are carefully carrying their new red mobile phone. • The man spoke quickly. • He got out of bed slowly. Remember: Adverbs go with verbs. Complete each sentence with the adjective or adverb in the brackets. Remember: Adverbs go with verbs.Complete each sentence with the adjective or adverb in the brackets. Reads is a verb. Adverbs go with verbs. Paul is a ___ singer. Paul is a good singer. Singer is a noun. Adjectives go with nouns. She is a ___ driver. She drives the car ___. She drives the car carefully. Drives is a verb. Adverbs go with verbs. You can ___ open this tin of tomatoes. You can easily open this tin of tomatoes. Open is a verb. Adverbs go with verbs. Be ___ with this glass of red wine. Be careful with this glass of red wine. Here taste is a noun because it talks about the feeling in your mouth. Here looks talks about the feelings of Vlad which you can see in his face. Vlad is a noun. Choose the correct form in each sentence. Are the words in bold adjectives or adverbs? We have worked hard all day. Adverb. Hard is both an adjective and an adverb, but here it connects with worked which is a verb. Adverb. Tight is both an adjective and an adverb, but here it connects with hold which is a verb. Richard quickly sketched out his design. She danced so gracefully across the stage. Boris climbed silently up the stairs so as not to wake the baby. Mother has baked delicious biscuits for afternoon tea. The Christmas decorations looked shiny. Should the missing word in each sentence be an adjective or an adverb? This car turns ___. Power steering is a big help. Adverb. Turns is a verb here. Is it a ___ flight or do I have to change? Adjective. Flight is a noun. The evening turned ___ when we started talking about ghosts. Adjective. Evening is a noun. Thanks. I am doing ___. And you? My alarm rang ___, but I hit the snooze button. He was ___ injured at work.